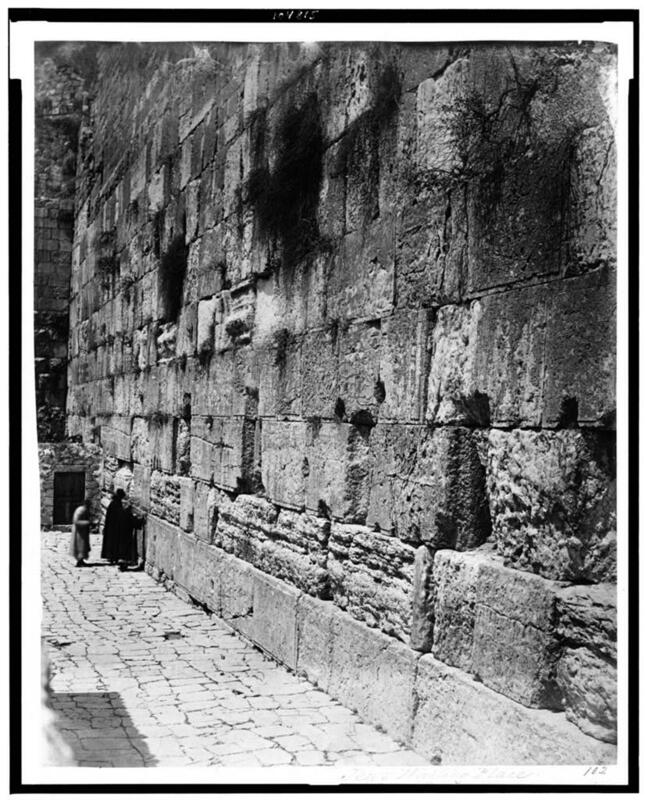 Picture a Day - The Holy Land Revealed: Ancient Pictures of the Western Wall, Including One with "Color Makeup"
Ancient Pictures of the Western Wall, Including One with "Color Makeup"
This photograph from the Palestine Exploration Fund is one of the oldest known photographs of the Western Wall, or the "Kotel." 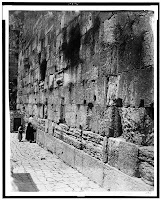 It was taken by Frank Mason Good in the 1860s, around the same time he photographed the panorama view of Jerusalem in the title picture above. Note the small and narrow confines of the Jewish prayer area. In the course of hundreds of years, efforts to purchase the surrounding areas were denied. Attempts to place benches or screens led to anti-Jewish riots, and the blowing of the shofar at the end of Yom Kippur was prohibited. Between 1949 and 1967 Jews were not permitted to pray at the site. ﻿﻿We present here other photographs from the Library of Congress collection dating back over 100 years. Most of the pictures were taken by the American Colony Photo Department and its successor company run by Eric and Edith Matson. They returned to the United States in the 1940s with their 22,000 photos and negatives. They apparently republished hand-colored versions of several of the American Colony's classic photographs, such as this picture of women and a Yemenite man at the Western Wall (left and right). ﻿View additional features on the Western Wall here, here and here. These are great pictures... they do beg a few questions though. 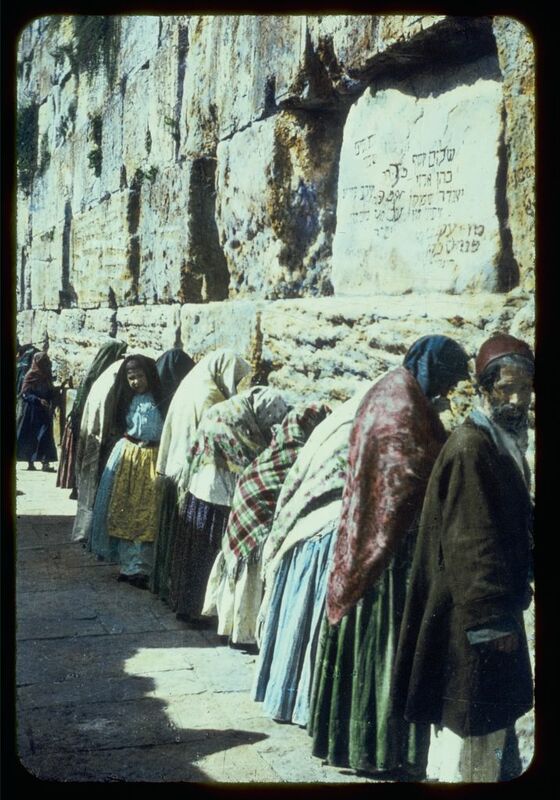 I notice that men and women are praying together at the wall. Where is that? Also, I do not remember seeing that Hebrew inscription stone when I was at the Kotel. Is it still there? or was it defaced after 1948? Even with Turkish rules, men and women could have self segregated. The separation of the sexes was not always so strict. The zealousness of the separation these days is a relatively new phenomenon. There have been mechitzot for a long time of course but Jews were a little more easy going about things back then. 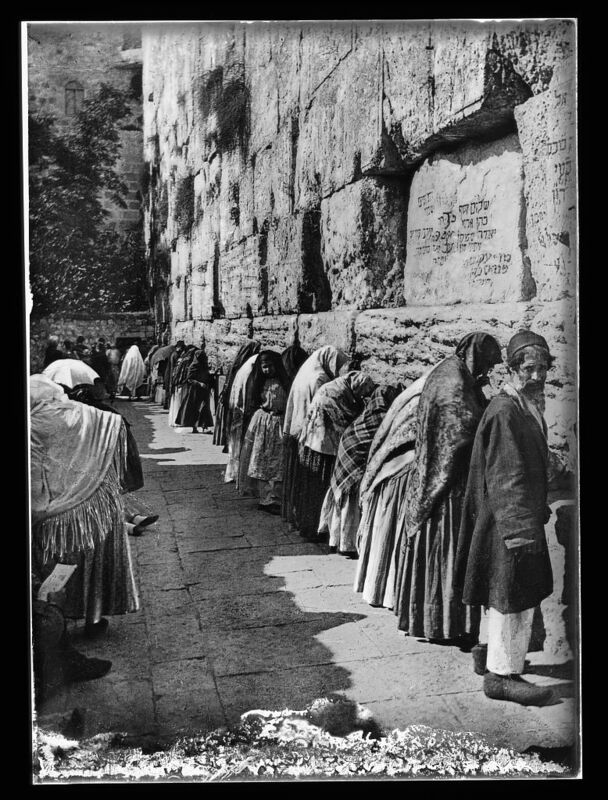 An individual praying at the kotel may have considered him or herself a congregation of one. Many things are more machmir today than they used to be. 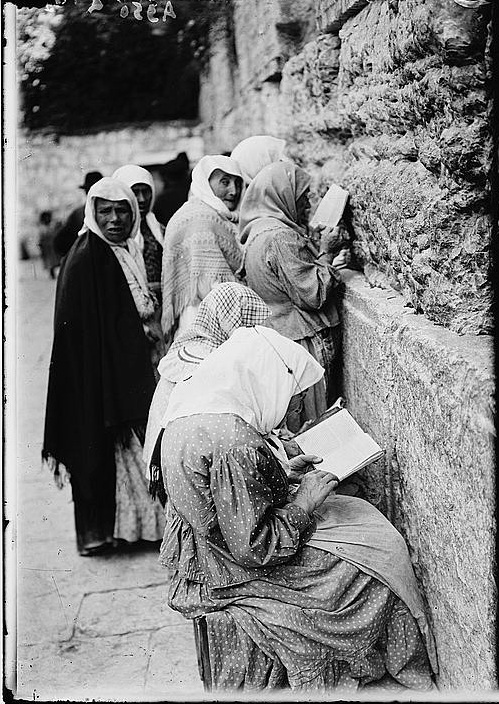 The Jews were prohibited by the Turkish rulers and Muslim Waqf from putting up screens between the men and women. The writing on the wall were memorial notices painted on the stones, not inscribed. On some old pictures the writing gives a clue to the date of photo. This is a great site, thanks for taking the time to put it together. 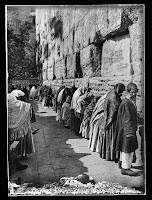 People did in fact carve things into the Kotel (people had different attitudes to things back then, and, again, the Kotel was not seen as "holy" as it is today). You can see traces of it today, except the street level was lowered in 1967 and the writing is now a few levels above the head.